Catfish pellets are tiny pellets of processed food you buy commerically. They come in lots of different types, some are targeted for specific species of fish. But most are suitable for other species like aquatic frogs. Some include 'heath boosters' like seaweed extract and other so called 'natural shields' against infections and disease. But little or no evidence is usually given on how this is supposed to work. The container should have a clear date stamp somewhere and you need to check this. 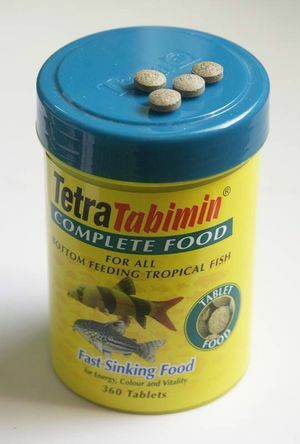 Fish food doesn't last forever, even if unopened, and you will want food that has at least 6 months of life still in it. All proper, high quality pellets should come in a sealed container of some kind as exposure to the air starts the decay process of any vitamins and protein. Never buy any that has the seal broken as they could be infected with bacteria. A typical catfish pellet product will list all its ingredients, the order these are shown indicate the largest amount of that food. Cereals - Often used to bulk out the pellet and to hold the pellet together. Vegetable protein - Adds extra protein. Makes it more acceptable for vegetarian fish. Oils and fats - This provides taste and holds the pellet together. Antioxidants - Helps preserve the food. Colourants - Makes the food look the right colour (to you, not for the fish). Ergosan - Typical Health booster. Various added vitamins - Add vitamins that were destroyed in the manufacturing process. 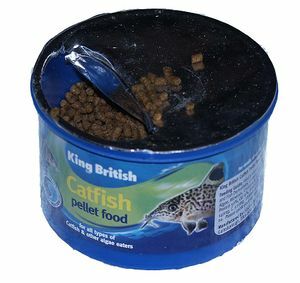 There are a number of auction web sites selling cheap fish food and you need to be careful. Often the sellers quote that they've bought a large Trade pack and are selling on small packets of this food therefore passing onto you the savings. This is a dangerous area, whilst there will be perfectly legitimate sellers there are also rogues. The pellets sold may not look exactly the same as the shop sold packets and often they are supplied in small plastic clear pockets. This of course means the food may have been exposed to light and air for some time. Plus you only have their say that the item is what they say it is and its expiry date is valid. Tip - Ask the seller for a photograph of the large packet they bought. Including the end of life date stamp. This page was last edited on 14 February 2011, at 01:52.